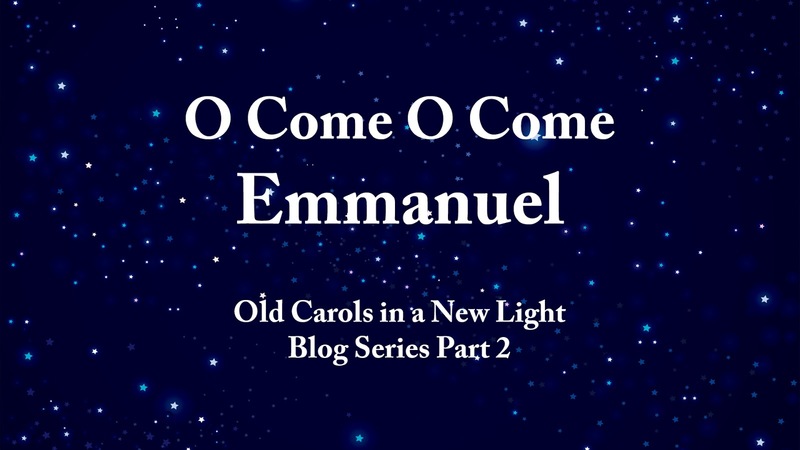 This is my final installment of “Old Carols in a New Light” for this year! I’ve enjoyed sharing these carols with you. 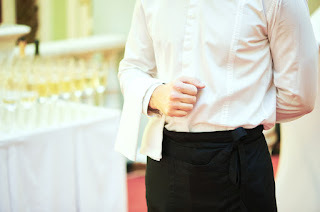 It’s easy to see why they have stood the test of time! There’s a lot of depth, a lot of meat to these hymns, and we could easily devote entire posts to digging into the truths contained in just a single line. So this carol was written to believers - the faithful - and we would not even know the carol today if it weren’t for several different men of God in different places and different generations being faithful where they were. Why Bethlehem? To fulfill the prophecy of Micah 5:2! When Herod wanted to know where the Messiah would be born, he called the priests and scribes. 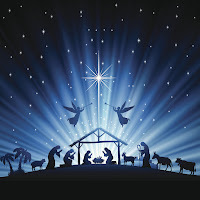 Based on Micah’s prophecy they told him the Messiah would be born in Bethlehem” "But as for you, Bethlehem Ephrathah, Too little to be among the clans of Judah, From you One will go forth for Me to be ruler in Israel. His goings forth are from long ago, From the days of eternity." 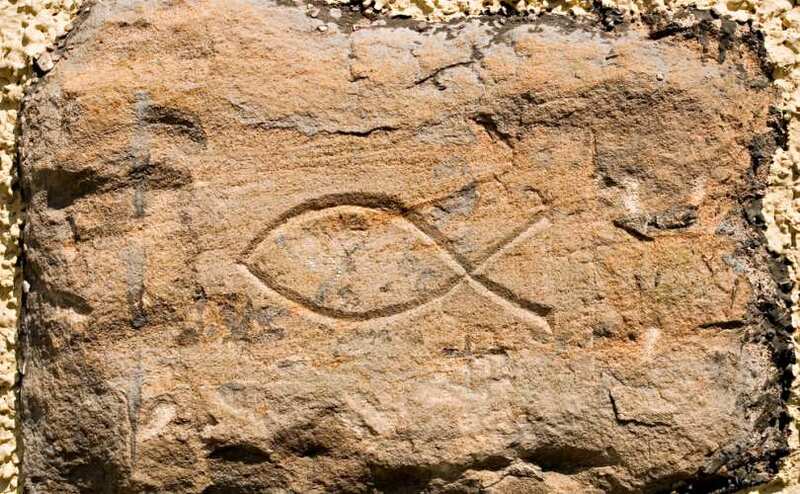 1 - In Hebrew, Bethlehem means “House of Bread.” In the Old Testament the Bread of Heaven (aka “manna”) sent by God to feed Israel in the wilderness is a “pre-shadow” of the Messiah. 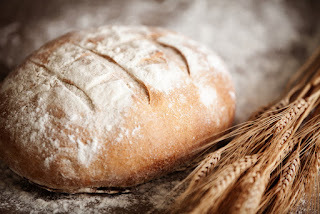 And you may recall, the Jews grumbled about Jesus because He said, “I am the bread that came down from heaven.” (John 6:41) So where else would the “Bread of Life” come from except from the “House of Bread” - Bethlehem? 2 - Near Bethlehem was a tower called “Migdal Eder,” the Tower of the Flock. It was the place where lambs destined for the Temple were born and raised. Every firstborn male lamb from the area around Bethlehem was considered holy, set aside for sacrifice in Jerusalem. The shepherds would separate the lambs, choosing only the perfect first-born males for the temple. Think about it - where else would “the Lamb of God who takes away the sins of the world” be born, if not in Bethlehem? And why else would the angels call shepherds to come inspect this first-born lamb? And how else could they respond, but to sing? These lines are based on the Christmas story as recorded in Luke 2. 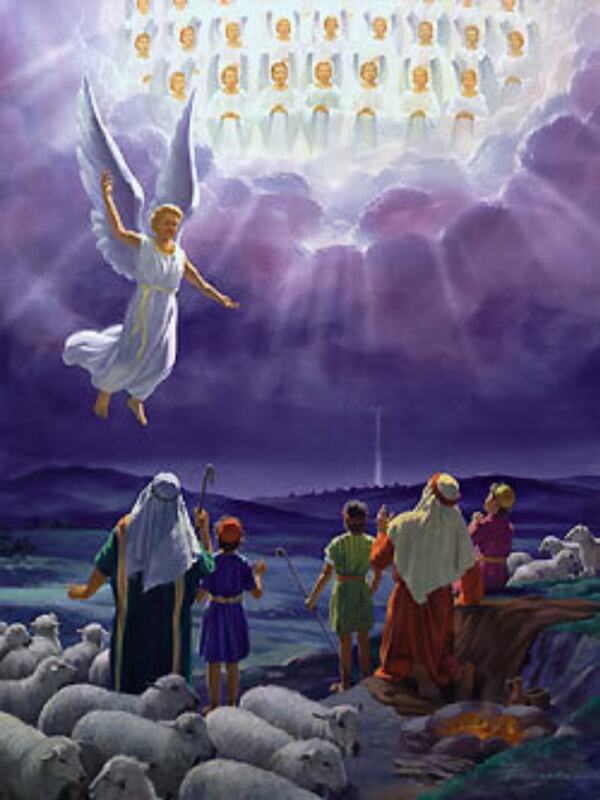 “And suddenly there appeared with the angel a multitude of the heavenly host praising God and saying, ‘Glory to God in the highest, and on earth peace among men with whom He is pleased.’” (Luke 2:13-14) It’s interesting that the word “host” is used in this verse. Normally, it is only used to refer to an army. So here we have an army celebrating peace! What better group to announce peace than a group that can enforce peace?! But notice that the angels did not come to give peace. They came to announce peace! And who has this peace? Real peace on earth exists only among those who are the subjects of God’s goodwill, who are characterized by goodwill toward God and man. This is an odd statement. Peace is not proclaimed to everyone. Only to those who please God. This is why Jesus came to bring a sword, to divide between those who are well-pleasing in His sight, and those who are not. So how do we become numbered among those who please God? Hebrews 11:6 tells us that without faith, it is impossible to please God. So if you do not believe, you can not have peace! But if you believe, God’s promise is peace. Wow! John 1:14 tells us that the Word became flesh. That means that Jesus took on flesh, took on our humanity, in order to save us. 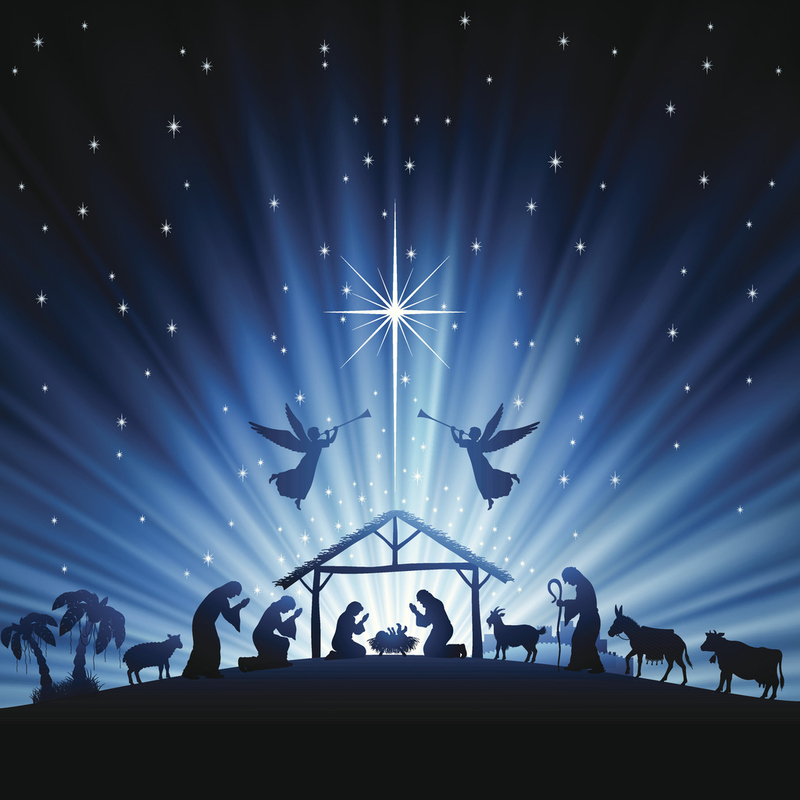 The theological term for “the Word of the Father, now in flesh appearing” is the Incarnation. That’s a big word, but it has an even bigger meaning. I’ve shared this story before but it bears repeating. One especially frigid night, a man who was not a believer heard some noise outside. It was a flock of disoriented birds, and he knew that they would freeze to death if they couldn’t find shelter. He ran to barn and threw the doors open. He whistled and tried to shoo them, but they wouldn’t go in. He took bread and corn and made a path, but they wouldn’t follow. Moved by compassion but frustrated by his inability to help, he longed for a way to just communicate with them. “If I could just tell them I don’t want to hurt them, that there’s warmth and shelter if they would just trust me. But I’m a man and they’re birds and we don’t speak the same language. If I could just become a bird, I could tell them!” Then it hit him: that’s what Christmas is all about. Without the incarnation, without Jesus, man would be wandering about, perishing, not knowing how to find shelter. So God became a man to tell us how to be saved! 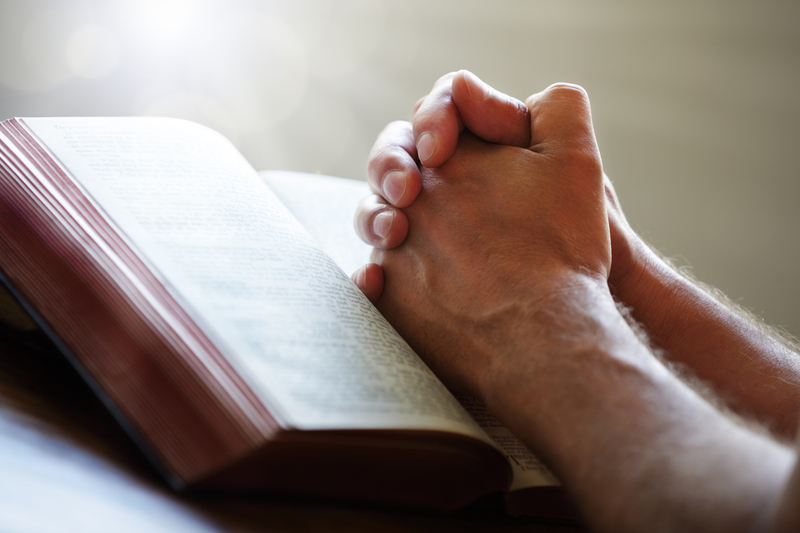 Unfortunately often in life, our circumstances threaten to take our worship in the opposite direction. When we first come to faith or have an experience that renews our faith, our worship is exuberant. Then life chips away at us. We still worship, but lose some of that joy. And when things get tough, we can find ourselves burdened by worries, diminished by feelings of loss, to the point where our adoration is barely above a whisper. It doesn’t have to be that way, it just sometimes is. The good news is there can be “times of refreshing” (Acts 3:19) all throughout our Christian experience. Sometimes we simply need to slow down and take stock of all that God has done for us, how He had mercy on us and saved us. Sometimes there may be some repentance involved as well. And sometimes God uses special celebrations, like the commemoration of the Incarnation or the Resurrection to restore His joy to our hearts. But the promised times of refreshing that Acts 3:19 speaks of “come from the presence of the Lord.” As you press in to Him, to seek Him with “all your heart” (Jer 29:13), you will find His presence becomes very real. So no matter where you find yourself on that continuum, whether you identify with the “joyful and triumphant” or feel like you’re in a difficult season, the call to worship remains: O come, let us adore Him! How about it? Let’s make this Christmas more about PRESENCE than presents - the presence of the Lord that floods our lives when we worship. O come, let us adore Him! Christ the Lord! 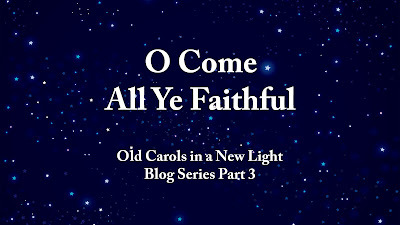 Back in December, 2007 I did a little 3-week sermon series called "Old Carols in a New Light." My goal was to explore some much-loved carols and help folks see the beauty in songs that sometimes are so familiar we lose sight of the truths contained within. Little did I know that would become one of my most looked-forward-to sermon series each year! This year at Christian Challenge Worship Center I’ve chosen to take an in-depth look at just one carol for the whole series - and it's one of the most beloved and oft-recorded Christmas Carols of all time: "O Holy Night." I began with the first verse this past weekend and will cover the next two verses over the next two Sundays. 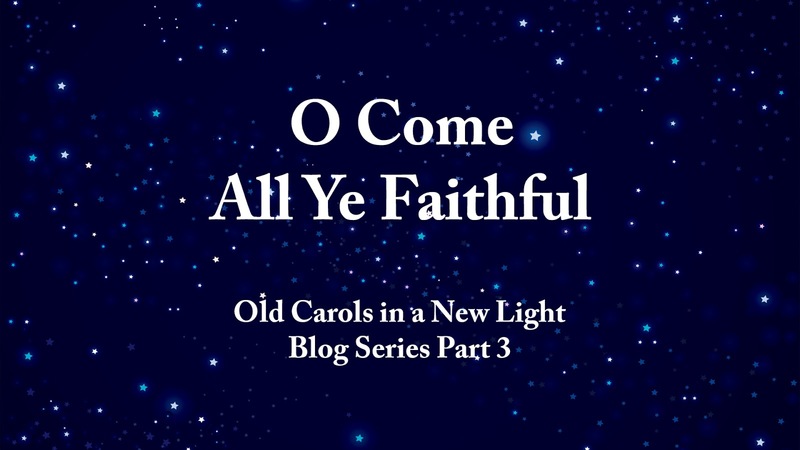 But in thinking about the blog, I thought how much fun it would be to revisit some of the carols I've taught on in the past! 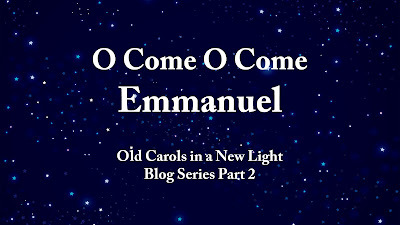 So for the rest of this month, I’ll be doing a series here on my blog on Old Carols in a New Light, based on the Christmas sermon series I began back in 2007. It seems appropriate to begin the web series where I began the sermon series 9 years ago with the much loved carol entitled Joy To The World! Isaac Watts was born in 1674 in Southampton, England, the first of 9 children, to a humble home. 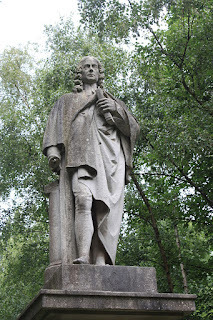 His parents were part of the “dissenters,” a movement that practiced non-conformity to the Church of England. As a result, his father spent some time in jail for his sermons and statements against what he viewed as faults in the Church of England. 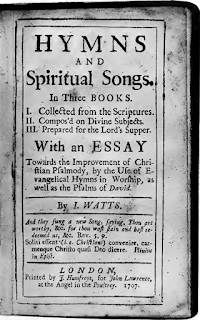 In the 1600s, many believed that the only songs that should be sung in church were the Psalms. They thought that God had inspired David and the writers of the Psalms and that only their words were worthy to be used in worship. This was the official position of the Anglican church. The words of the Psalms were put to tunes of the day for use in worship and there was no other option. But the non-conformists had a different perspective. They believed that since one could pray to God spontaneously and not in the exact words of Scriptures, the same should be true for expressions of worship. 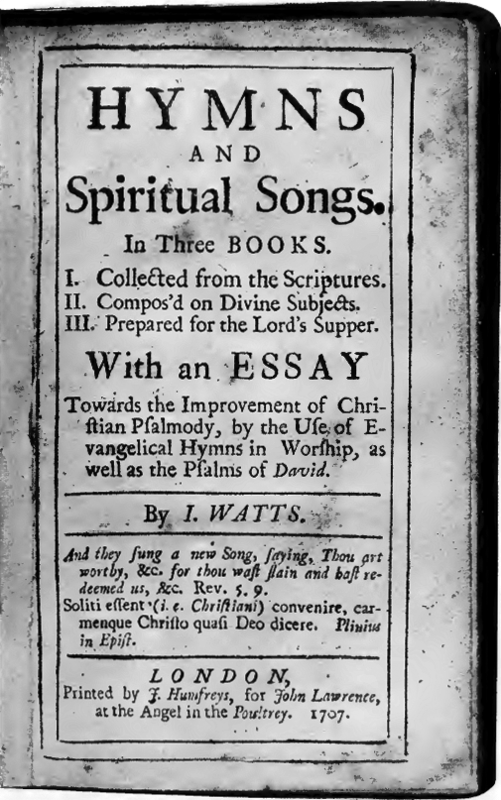 Isaac Watts himself is quoted as saying that though “the ancient writers were to be imitated, they were not to be copied.” He also said that the forced tunes the Psalms were sung to often sounded like a rusty saw was being sharpened close to his ear! Thus, many new hymns began to be written to express the truths of scriptures in rhyme and the language of the day. But some of these lacked quality. When young Isaac complained to his father about some of the songs, his father challenged him to do better. And so he did! Each week he composed a new hymn to go with the sermon, first with his father’s sermons and later with his own sermons as he became a pastor. It is said that a young Jewish girl read these words on a piece of paper that had been wrapped around a block of cheese she bought. She could not shake off the impression produced by the striking words; so she obtained a Bible and read it eagerly. 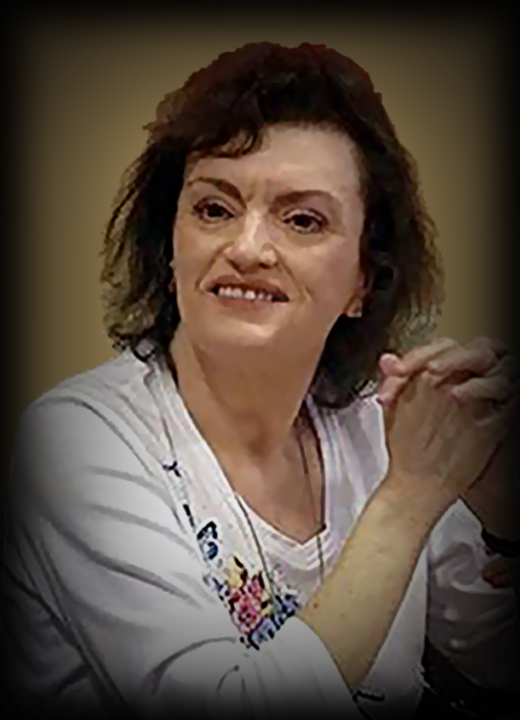 She soon found in Jesus her true Messiah and Lord. 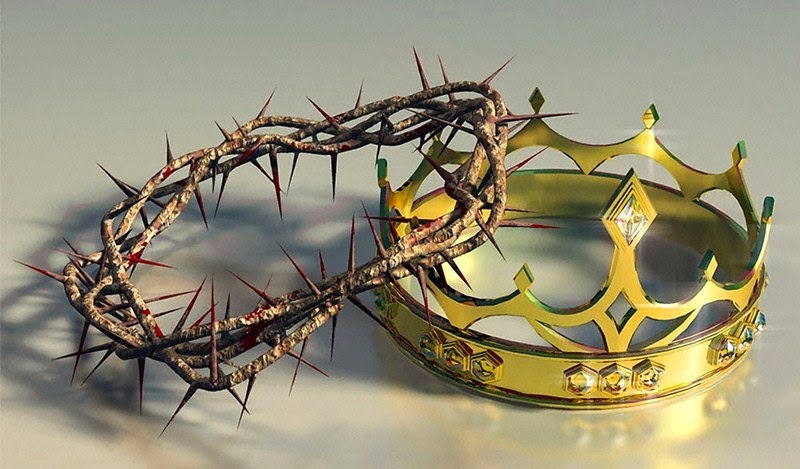 The earth has a King whether He is recognized or not (John 18:33-37). Jesus is the KING of kings. 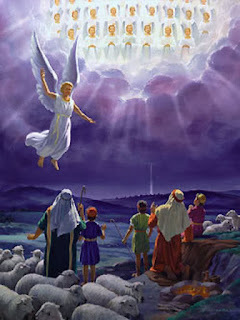 At the end of time He will be revealed as such (Rev 19:11-16). Jesus is the message of the song because He is the King. Think about it. The pain of childbirth is a result of the Curse. 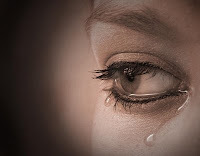 Struggles between husband and wife are a result of the Curse. Thorns and thistles are a result of the Curse. Hard living is a result of the Curse. Death is a result of the Curse. And just how far is the curse found? According to Rom 8:19-22 the curse affected the whole world. The whole of creation is longing for redemption from the curse, which is proclaimed by this wonderful carol! But please note that His blessings flow to those who have made room in their hearts. And the curse is removed in Christ (Gal 3:13) and will ultimately be removed from the whole earth (Rev 22:3). 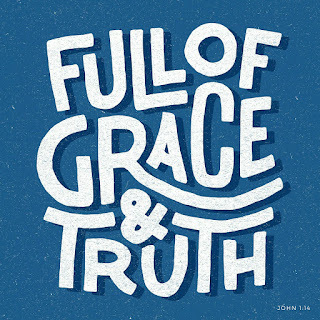 In its final verse our carol draws to conclusion by pointing out that in Christ, grace and truth work together. We need the truth. We need to see things as they clearly are. We will never deal with the issues of our life until we see the truth. Did you know that’s why the Law was given to us? To expose our hypocrisy, our self-righteousness, our utter failure at being worthy of eternal life (Gal 3:19). It’s like the little boy who saw the emperor had no clothes. Without the truth, we all parade around like pompous Pharisees, congratulating each other on how pretty we look. And the truth is, we stink! The Law exposes our nakedness. I don’t think Isaac Watts intended this song to be kidnapped and held hostage to the Christmas season. This is a song of great joy the whole year long. It’s one of the finest missionary songs ever sung! It’s a song of hope, the message of joy and love replacing sin and sorrow. It is the Gospel! Let me close by asking you a few questions: Have you experienced the message of “Joy to the World?” Has your heart prepared Him room? Is He reigning in your life? I pray that you can answer “Yes!” to every one of those questions and that you find His blessing flowing where the curse was once found. May you have JOY this Christmas season, and all year ‘round!